Unlike the immortalized Great Wave off Kanagawa, woodprinting now features some more modern plumbers, heroes, pocket monsters, and the fastest hedgehog. Beyond pixels, videogame characters are now hard at work in "floating worlds." Ukiyo-e, the traditional Japanese woodprinting craft has been around for nearly 400 years with its origins as illustrations for books and posters for the kabuki theater. Today the craft is a relic of a past and an example of classic Japanese illustrations. It fell out of popularity with the adaptation of new media, but a comeback has arrived. The Ukiyo-E Heroes collaboration between illustrator Jed Henry and craftsman David Bull has brought ukiyo-e back from classical art as they use traditional prints to reimagine classic games as scenarios in medieval Japan. Henry described himself to Co.Design as a "Japan nerd" wanting to combine his passions for Japan, videogames, and illustration. After seeing Henry's design of Kirby as a frog demon and King Dedede as a samurai spirit, Bull and his team were in awe. "A lot of the design decisions of these old '80s Nintendo games are inadvertent descendants of Japanese woodblock printing," Henry said. "If classic games like Super Mario Bros. or The Legend of Zelda were made in Germany or America, they'd look very different." Ukiyo-E Heroes began as a Kickstarter campaign, widely surpassing its $10,400 fundraising goal by $300,000 in one month last year. Very few people in the world today still know the ancient woodblock printing techniques, and materials are expensive, which is in part why the craft diminished. Ukiyo-e began during Japanese urbanization, and primarily the middle class used the craft to illustrate stories based on Japanese culture, such as the famous Great Wave off Kanagawa. Looking at some of Japan's exports today, woodprints of videogame characters hardly seems strange. The narratives behind traditional woodprints dramatized brave heroes, holy weapons, and battles against horrifying creatures. That doesn't sound too different from the games we play today. 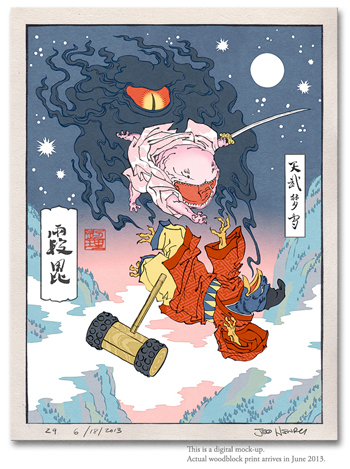 To see other Ukiyo-E Heroes prints, check out their store.